What is Mediation for Divorce and What are the Processes and Procedures for Mediation in Singapore? What exactly is Mediation for Divorce in Singapore? Mediation is a form of alternative dispute resolution in Singapore. Unlike what occurs during litigation, mediation is non-binding, and as opposed to a judge who precedes over the courtroom, mediation involves a neutral third party (judge-mediators or other volunteer mediators) who will assist the divorcing parties in trying to reach a mutually agreeable solution. 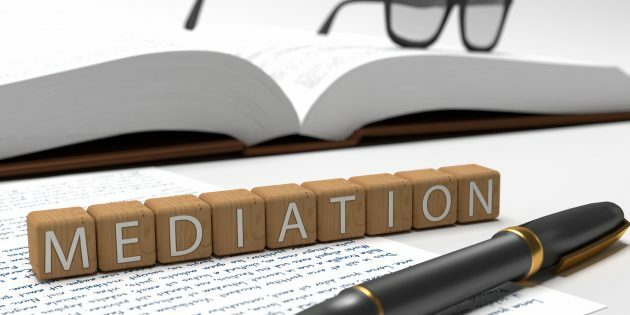 In Singapore, there are several forms of mediation in divorce but they can be predominantly separated into two categories – voluntary and mandatory. Are there any Advantages to using Mediation for my Divorce in Singapore? Allowing parties to make their own decisions on how to resolve conflicts and disputes. Facilitating dialogue between the parties. Allowing parties to retain complete control over the outcome. Avoiding the risk of a decision imposed against the parties by a judge. This is especially so with divorce proceedings where parties may feel happier with terms that they have agreed on as compared to orders made by the Court. Assisting parties to find practical and creative solutions by taking into account their concerns and goals, without deciding who is right or wrong. Saving time and legal costs. Avoiding the emotional trauma of undergoing a contested hearing or trial which is likely to increase tension, stress, acrimony and costs. The CFRC provides specialized and dedicated services for mandatory counselling and mediation for divorcing couples with children under the age of 21. Where the children are below the age of 14, the divorcing parents will have to attend mandatory counselling conducted by the CFRC. Where the divorcing parties have children between the age of 14 and 21, they will be required to attend mediation at the Family Court to address their ancillary issues, such as custody, care and control and access. The divorcing parties will be given formal notices to attend the mediation. Mediations are generally less formal than court proceedings and meant to encourage cooperation between the parties. The mediation sessions will usually be completed within two to three sessions and conducted prior to actual contested divorce hearings. While nothing is binding on the parties should there be no agreement, if both parties manage to come to an agreement, this agreement will be recorded and binding on them in accordance with the law. The CFRC began operations in 2011 and its scope applies to divorces filed after 1 October 2014. It seeks to address the rising divorce rates in Singapore and its primary purpose is to assist parties to focus on the welfare, needs and the interests of the children. In Singapore law, the Family Justice Court is empowered to direct suitable cases to mediation or counselling services as it sees fit. These cases would have commenced proceedings and are likely to already be in the thick of divorce proceedings. Generally, mediation ordered by a judge during divorce proceedings will be held at the Family Resolution Chambers at Level 4 of the Family Justice Courts. Co-mediation may be ordered by the Court if there are complex legal and emotional issues at play. During such co-mediation sessions, a Judge-mediator and family counsellor will be present to assist the relevant parties address these issues in a comprehensive manner. Private mediation is an alternative for parties who cannot settle their issues in an uncontested divorce but do not wish for their dirty laundry to be spilled out in a courtroom. It offers parties the chance to settle their differences in a slightly more structured environment (as opposed to deciding on everything themselves) while still maintaining amicability. The main difference between court and private mediation is that you’ll have to pay for private mediation while court mediation is free. The Singapore Mediation Centre (“SMC”) launched the Matrimonial Mediation Scheme in 2010 to resolve matrimonial disputes affordably, amicably and quickly. Under this scheme, the mediator will assist the divorcing parties to resolve their ancillary issues. This mediation can be initiated by any one of the divorcing parties. Once a divorcing party has done so, the SMC will then contact and convince the other party to participate in the mediation. Similar to Court Mediation, Private Mediation is non-binding if the parties do not come to an agreement. Should the parties reach an agreement, it will only be binding when this agreement is recorded in writing and signed by both parties. The CFP is another mediation scheme run by the SMC and it takes place before the start of any court proceedings. Both parties must agree to the CFP scheme and this CFP scheme has specially trained lawyers and other family specialists, such as financial advisors and child experts to work with the divorcing parties to come up with a suitable agreement. The CFP lawyers are trained to encourage the couple to communicate directly with one another. They will provide legal advice and assist in trying to help the parties reach an agreement. If an agreement can be reached between the parties, this agreement will then be filed with the Family Justice Courts. In the event the parties fail to reach an agreement, the CFP lawyers cannot further represent their clients in future litigation proceedings. The divorcing parties will subsequently have to hire different lawyers to represent them for the court proceedings. 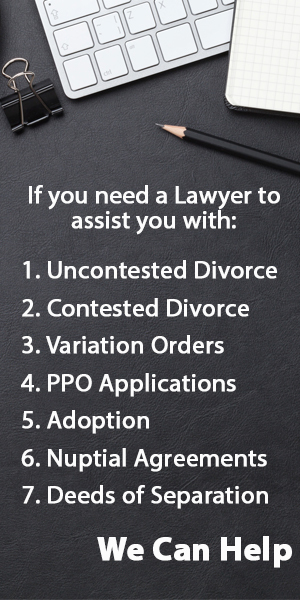 This is the main difference between CFP and other forms of mediation, where the divorcing parties can still retain the same lawyers for litigation proceedings. There is an hourly rate of S$428 per hour for a CFP lawyer from SMC and a deposit will be collected once the lawyer is appointed. The parties (together with their respective lawyers) then attend before the mediator who assists the divorcing parties in trying to reach a settlement by way of negotiations. If the parties are able to resolve their issues amicably, the terms of settlement can then be recorded in a consent Order of Court. Hire us to Handle your Mediation and/or Divorce. We answer all your queries within 24 hours.